Defined by a rhythm of repeating layers, Architect Danny Cheng of Hong Kong based architecture firm, Danny Cheng Interiors, constructed an A-frame structure surrounded by a circular pond that sits on the coastline of Hong Kong's Discovery Bay. The steeply-angled sides of The White Chapel pay homage to an architectural style that has been present through history. The A-frame structure is sharp, dramatic, and sculptural - and with the open rafters, Cheng was able to create a repetitive layering effect that hides all of the bulky technical equipment. 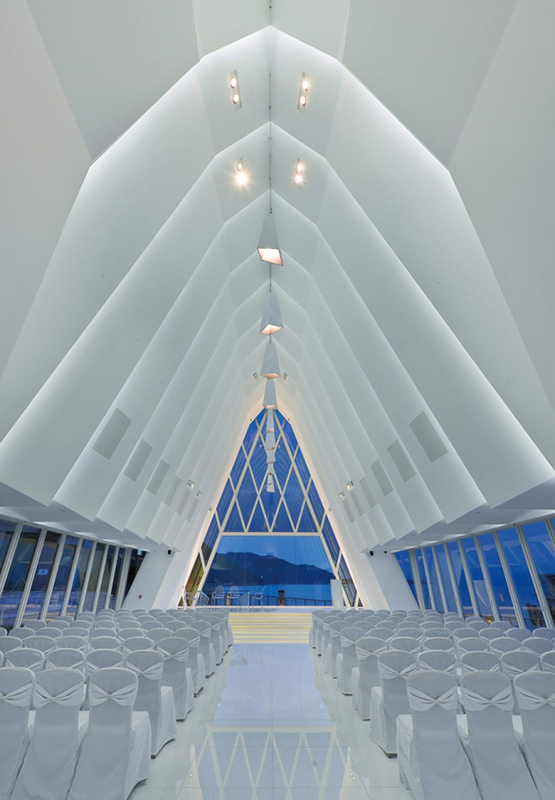 The architect used white in the chapel to create a contrast from the stunning aquatic surroundings. A still, shallow pool of water surrounds the chapel, reflecting its image perfectly at night. Inside, the pews (chairs) are arranged in a traditional manner - cut down the middle facing front. On the stage, a long transparent Lucite table along with angular Lucite chairs leave the architecture uninterrupted. Cheng played with the idea of reflections throughout the space by introducing high gloss white floors that mirror the dynamic interior architecture. While outside, the pond creates a dramatic reflection of the exterior shape of the chapel.